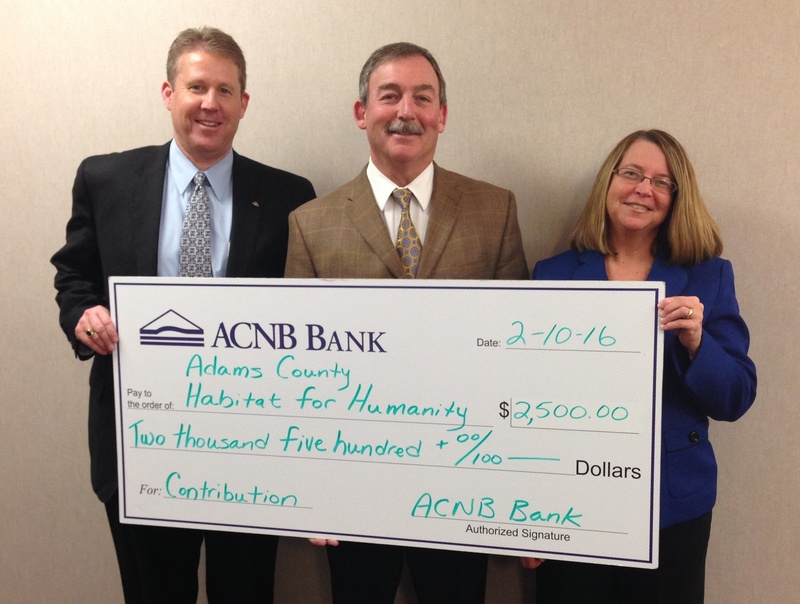 Adams County Habitat for Humanity recently received a $2,500 contribution from ACNB Bank. This community organization builds and renovates homes for families in need, as well as provides financial education. Since its inception in 1988, Adams County Habitat for Humanity has helped provide 35 homes to low-income families deserving of home ownership. Partner families invest up to 500 hours of “sweat equity” in their homes, working alongside community volunteers, covenant church partners, and skilled laborers who often donate their services in order to construct or rehabilitate the homes. To learn more or to make a donation, visit habitatadamspa.org. 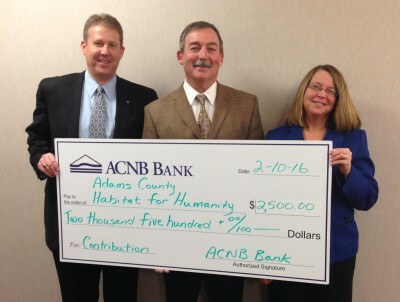 ACNB Bank’s contribution was acknowledged with a check presentation. Taking part in the presentation are (left to right): James P. Helt, ACNB Bank President; C. L. Pete Ricker, ACNB Bank Senior Vice President of Retail Lending and President & Chairman of the Adams County Habitat for Humanity Board of Directors; and, Cara Lynn Clabaugh, ACNB Bank Vice President/Compliance & Community Reinvestment Act Officer.